There are days where you wake up and have an idea so amazing, you know you have to try it immediately. Something that achieves multiple goals at once, and gives you an excuse to go to Disney World. I woke up this particular morning envisioning a way to exercise, get coverage for my writing on Vinylmation World, and hopefully wear myself out enough to sleep better than I had in days. I was going to try something new, the Vinylmation Trading Dash. For those who don't understand the strange world of Vinylmation, the plastic figures are often sold in blind boxes, making it mostly random chance what figure you receive. To alleviate some of this randomness, Disney has provided one to two locations at each theme park where you can trade for either one of a few visible figures, or take a couple chances trading from a mystery box. This mostly results in receiving Vinylmation being clearanced at the outlet stores, but occasionally there's a hidden gem or two inside. The concept of the Dash is simple. Visit all of the trading locations available in Disney World's theme parks and Downtown Disney in as little time as possible. I had the added goal of visiting all shops that sold Vinylmation, to provide pictures of available stock. This meant that I would have to essentially circle the entirety of all four theme parks before leaving. There was also the additional stop of a visit to the aforementioned outlet store, which had such a depleted stock recently that it must have something interesting soon. I had to leave for home at 3:00 pm, which gave me approximately 6 hours from the time of park opening. It would prove to both be too little time and plenty, which will make more sense later. 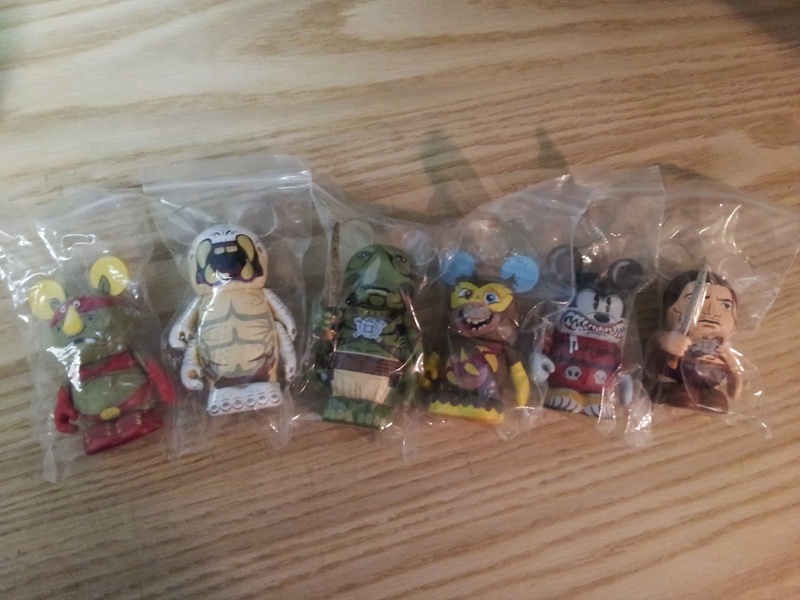 I brought six Vinylmations for trading purposes, which was technically one less than the number of trading locations available. However, the odds of actually getting something worth keeping at all seven locations was incredibly slim. I could have brought half as many figures and have had no problem. The journey began at Animal Kingdom, walking through the front gates only a few minutes after the official opening. As usual, most guests were racing towards the back of the park for Kilimanjaro Safaris, leaving the nature paths mostly deserted. I stopped along the way to visit with my friend the mara, one of the world's largest rodents. It usually spends most of the time hiding in the bushes, but this morning it was sunning itself sleepily while it ignored the leering tourists. Getting back on track, I stopped at the first trading destination, Island Mercantile. The clear box at this location was one of the better of the day. The clown and Buford, from Phineas & Ferb, were items recently on sale, but the bizarre totem pole of animals with a pig on top is a relatively current item. It's also one of the least popular from its series, but it's a design I like, at least. However, I already have one in my collection, so I decided to try the mystery box. Who doesn't love a good mystery box? I was excited with my find at first, because it's one of the recently released Muppets, Crazy Harry. Unfortunately, this particular Vinylmation was a fan of Clint Eastwood, because he was a Dirty Harry. The figure looked to have been dropped, repeatedly, onto a particularly filthy floor. It would be returning to the trade boxes at my next stop. Running around the back of the park, I noticed a few people emerging from a path between the Africa and Asia sections. I had never noticed the spot before, assuming it was a Cast Member only walkway. Following the trail, I discovered a beautiful path surrounded by foliage and gentle streams. While no shorter than the normal route, it was a wonderful find that will be a great way to circumvent crowds on busier days. I never stop discovering new things at Disney World. On my way out, I stopped to check on the Cotton-top Tamarins, who seemed to be cursing the sun as much as I was. The temperature was rapidly increasing, and I was cursing my failure to bring a hat or sun screen. Dodging incoming tour groups, I quickly slipped out the front entrance and walked back to my car, thinking that my pace so far was just fast enough to make it through everything. Hollywood Studios was my next destination. Forcing my way through the crowds, I visited Villains in Vogue, the Vinylmation center of the Studios. This clear box was taken over by figures devoted to college sports, a series that has long haunted the shelves of the outlet stores. The mystery box once again provided me with a new Muppet, but this one was the amazing Uncle Deadly. Even though he's one of the more obscure Muppets, he's also one of the most interesting, and partially inspired by the great Vincent Price, as well. It was a perfect find, especially since Hollywood Studios is home to the only Muppet attraction in Disney World. Finished with my coverage, I left Hollywood Studios and walked swiftly to my car. I walked down the lane, only to discover that my car wasn't there. Apparently, I had forgotten the exact aisle number. After searching three more aisles, I finally discovered my car only a few yards from where I previously searched. Cursing the waste of time and the growing heat exhaustion, I headed towards Epcot. My original plan was to park at Epcot, then use the monorails to visit Magic Kingdom. The Kingdom has the best trading spot in Disney World, as it has multiple clear trading boxes in addition to the mystery box. However, I could already see I was going to run out of time too quickly, and my legs were sore from miles of walking. I decided to concede part of my goal and skip Magic Kingdom. Epcot was also particularly busy for a weekday, due to the ongoing Food and Wine Festival. While I would normally be excited to be in Epcot with both food and wine, I was running on limited time and had healthier goals. The clear box at MouseGear, the massive Disney souvenir store, was the most pathetic of the day, containing only two Vinylmations. One was another sports team, and the other was a superhero chicken from the ill-fated Zooper Heroes series. The mystery box proved no better, giving me the Prom King from the equally unloved High School series. Since I had no particular love for High School or a Vinylmation series based on it, I knew this figure was being traded again. There are two trading locations at Epcot. The second is located at Disney Traders, one of the two stores that flank the pathways to World Showcase. Seeing a clear box as depressing as the rest, I gave my mystery picks. For the record, I always pick thirteen, because I'm anti-superstitious in my superstition. This provided a Big Baby from the long gone Toy Story series. Big Baby is probably the least popular from the set, being a creepy design that appears damaged on purpose. I already have one of these, so again this would be traded on to another location. At this point, I was slightly sunburnt, aching in half my muscles, and losing morale as my trading provided increasingly diminishing returns. My spirit almost broke completely when I arrived at D-Street, the center for all things Vinylmation at Disney World. A sign alerted me to the fact that an artist signing was scheduled for that night, something I felt obligated to cover for my reporting role. If I would have remembered that I would have to return to Downtown Disney that night, I would have had plenty of time to visit all theme parks. My spirits were given a vital boost by my trading. D-Street is the only store that enforces strict rules, requiring that guests trade no matter what they receive from the mystery box. I couldn't conceal my excitement when I received one of the brand new Marvel Vinylmations, this one depicting the superhero Vision. After walking to the far end of the shopping center, I discovered that the other Downtown Disney trading location had the most ridiculous clear box of the day. It contained three identical High School Vinylmations, three coaches with angry visages shouting from their plexiglass prison. Since this store, Pin Traders, is the pin trading center, I didn't expect much for the vinyls. I was shocked, then, when I received a Toy Story series Rex in perfect condition. That shock only increased when I was also handed the collector's card that came with the figure, something that newer series no longer include. The cards were almost never traded with the figure, so finding an older figure, in great shape, with its card is only slightly more likely than seeing a unicorn gallop down the street. My trading dash had a positive conclusion, even if I didn't successfully complete it. Out of six times trading, I ended up with three figures worth keeping. This wasn't a terrible result, especially compared to the other results. Instead of sleeping well that night, I spent half of it awake with a sore back and legs, and no weight loss was apparent until a couple days later. However, I know I'll try to complete the Vinylmation Dash again some day, because I'm stubborn, have an annual pass, and am just crazy enough to put myself through it again.